Cutmen have been in the news a lot recently, ever since Jacob “Stitch” Duran announced that he was let go by the UFC for his comments regarding the Reebok deal. We’ve profiled the cutman job here before and it seemed appropriate to re-visit the work a cutman does inside of the Octagon, specifically in the most recent card, UFC 189, which was as epic as it was bloody. Cutmen played a critical role in that card, keeping fighters in the fights. Mike Afanasiev drew a row of difficult assignments that night, after veteran cutman Rudy Fernandez stepped aside and let Afanasiev finish out the card. He had Thomas Alameida, Jeremy Stephens, Rory MacDonald and Conor Mcgregor—all of whom suffered cuts and swelling. Cutmen have a few different tools to help them in their trade: the inswell, a cold piece of metal pressed against a a bruise to reduce swelling; a cotton swab dipped in adrenaline to help close cuts; chunks of semi-frozen vaseline to help stop bleeding and close up cuts as well; a towel. That’s it. They have 45 seconds to a minute to address a variety of injuries while the trainer yells instructions, the doctor assesses the situation, and the fighter tries to gain his breath. It can be frantic work. UFC 189 was particularly frantic at times, as each fight “over-delivered” and led to one of the most visceral fights the sport has ever witnessed. It began with a busted nose. 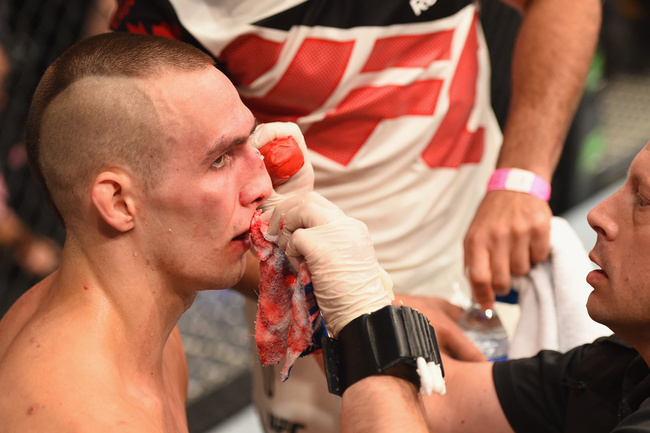 Alameida was the first on that main card and he had a bloody nose with a really difficult cut on the bridge. The cut wouldn’t stop bleeding, “it was like a slow river,” and there isn’t much a cutman can do on a place with soft, thin skin like that. 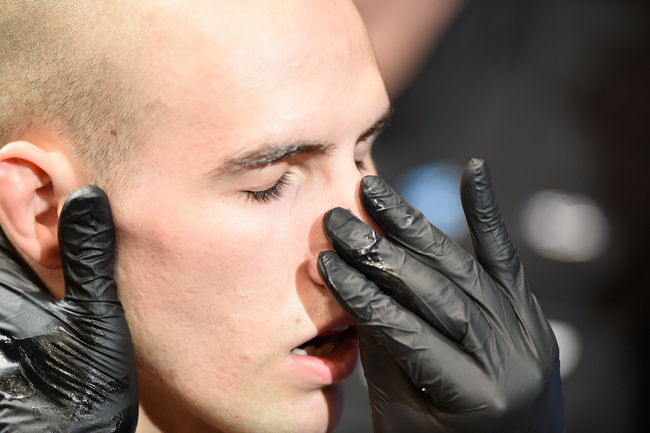 The main focus is to give the fighter an opportunity to continue, so the priority with Alameida was keeping the nasal passages clear to allow for breathing, and stem the flow of blood enough to make him look clean for those few initial moments. You can see Alameida’s bloody face when he lands that flying knee that put Pickett away— the type of injury that won’t stop a fight, but instead draws us in and presages more to come. Stephens suffered a deep cut on the inside of his eye, a cut that could have potentially stopped a fight. Afanasiev stopped the bleeding going into Rounds 2 and 3, but whenever Dennis Bermudez applied the grind, the cut would open back up. An arduous, less elegant version of the Alameida fight, in which a bloodied fighter took the win with a dramatic flying knee to the face. Then came MacDonald and his array of cuts and swollen features. Afanasiev didn’t see anything he hasn’t seen before—broken nose, shut eye, cuts and bleeding—but never all at once, and growing worse over five rounds. A cutman has to prioritize. Which injury can lead to a doctor stoppage? Which injury impairs the fighter the most? In Rory’s case, it was the swelling around his right and left eyes which affected the fight most. If you can’t see, you’re going to get hit worse. Next came the bleeding from his broken nose, which really never stopped. The key here is to keep the clots in his nose from loosening up or getting shot out a la Eddie Alvarez, when he cleared his nose and sent swelling right into his eye socket. That’s not counting the four serious cuts and few other nicks that were bleeding as well. Afanasiev had less than a minute to wipe Rory down, assess the damage, prioritize and make a list, and then actually try and fix things, before the fighter is thrown back out there to deal with more Robbie Lawler punches. All this during the most deafening crowd he had ever heard, on an epic card with a record breaking gate, with fighters going above and beyond the call of duty—hurling their bodies into this event. There is a photo of Rory sitting on his stool between the fourth and fifth rounds. He looks like a war-boy, in the moment like a raindrop, disconnected from the seconds that just passed and the seconds to come. A trickle of blood from his nose. His eyes swollen up and dark like warpaint. A few hands hover on the periphery, one of them belonging to Mike Afanasiev. The only regret he has from that fight is not having more hands. The cut on Conor’s face was anticlimactic, like anything would have been after the previous battle. Just a small cut above the eye, bloody, but nothing to be worried about. It’s not what we talked about really, during the hour or so phone call. It was basically just Rory MacDonald and the fact that men have but two hands.